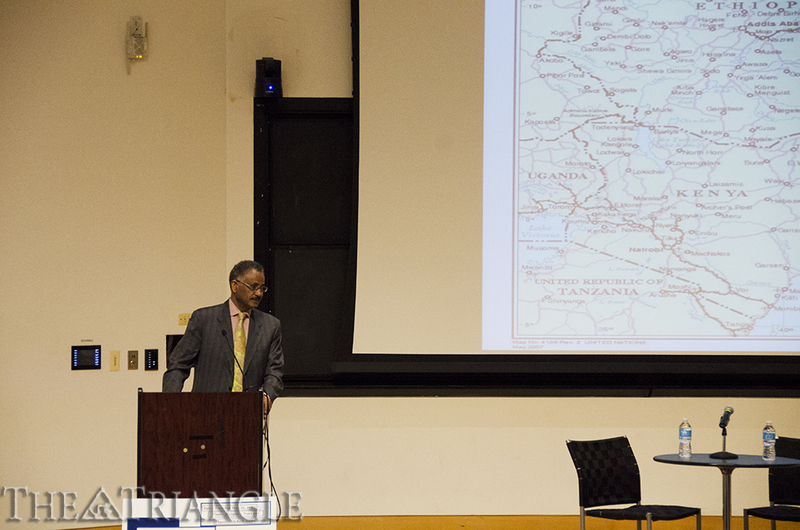 Ambassador Andebrhan Giorgis led a discussion May 21 at Drexel’s Mitchell Auditorium about his native country of Eritrea. The event was titled “How To Build A Country From Scratch,” and it touched on issues such as youth development, war and corruption within the geopolitical context of nation-building. Eritrea is a state bordered by Sudan, Ethiopia and Djibouti and is located on the Horn of Africa, adjacent to the Red Sea. It is a country with a turbulent history. The territory was originally an Italian colony and then a British colony throughout World War II. Following the war’s culmination, the British ceded their sovereignty over to Ethiopia. The annexation was unpopular with the majority of Eritreans, who were worried about sectarian violence. After an economic crisis and numerous instances of religious persecution, a bloody war of independence followed for 30 years. The majority of the fighting against Ethiopia was carried out primarily through small-arms tactics and guerrilla warfare. While there were originally many different rebel groups at the beginning of the conflict, the Eritrean People’s Liberation Front emerged as the principal combatant in 1981. Finally in 1993, after the Soviet Union terminated its military aid to Ethiopia, the EPLF assumed complete control of Eritrea. A referendum was held two years after liberation, and an overwhelming majority of the populace voted for independence. A new government was founded under EPLF, and new President Isaias Afwerki declared the nation an independent state May 24, 1993. In 1994 the EPLF was transformed into the political party called the People’s Front for Democracy and Justice. The PFDJ, under Afwerki, still maintains governance over Eritrea today. This 20-year period of governance by the president and the ruling party formed the main crux of Giorgis’ lecture. Quoting liberally from African poets and scholars, Giorgis was appalled by the political corruption that had taken root in his mother country. Political power resides only with “those who control the barrel of the gun,” he said. He spoke about the sacrifice and courage of the Eritrean people and their willingness to fight for independence. “Every [Eritrean] family had at least one martyr. The people have paid a high price for freedom,” he said. He referred to their constitution as “just ink on paper” and grew forceful as he spoke about the citizens who try to escape the authoritarian country. “Many of my former government ministers, my friends, have been detained or forced into exile,” he said. Eritrea, which had once been thought of as a nation of progress and democracy, has become a “basket case of false hopes and thwarted expectations,” he said. In his conclusion, Giorgis outlined key strategies for nation-building, including state transparency, an enhanced security sector and a redistribution of civil service employment. A question-and-answer session followed the lecture. Drexel students brought up various issues ranging from economic development to parallels with the Arab Spring. Giorgis was a founding member of the central committee of the EPLF. After Eritrea gained independence, he served as president of the University of Asmara, governor of the Bank of Eritrea, a member of the Eritrean National Assembly, and an ambassador to numerous European nations and the European Union. Giorgis is currently a board member and senior adviser of the European Center for Electoral Support, a senior expert in the Peace and Security Section of the Global Governance Institute, and an adjunct professor of Diplomacy and African Politics at Vesalius College, Free University of Brussels. The event was co-sponsored by Drexel’s Office of International Programs and the Drexel Student Alliance of the United Nations Association.